The Annunciation Greek Orthodox Church is a Greek Orthodox church on Manhattan's Upper West Side at West End Avenue and West 91st Street. The Greek Orthodox Church of the Annunciation (Evangelismos) is a parish of the Direct Archdiocesan District of the Greek Orthodox Archdiocese of America. 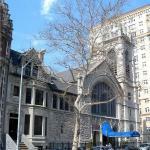 The church was built by Heins & LaFarge in (1893–94) as the Fourth Presbyterian Church. The church was sold to a Greek parish in 1952. The rusticated masonry façade with a sparing use of Venetian Gothic and Richardsonian Romanesque details and the square corner bell tower with a crenellated parapet embellished with gargoyle gutter-spouts reveal Richardson's training. Fine stained glass may be from Tiffany studios, or may be by John LaFarge, the architect's father, which would make them even rarer.